BetChain Review (2019) - 150% Bonus up to 1 BTC + 200 free spins! BetChain Casino is a Bitcoin casino established in 2013 so they are not a new player in the crypto casino field. BetChain has an enormous game selection and huge deposit bonuses in Bitcoins and also to Ethereum, Litecoins, Dogecoins or Bitcoin Cash. Many provably fair games Join now! The lobby of BetChain casino. BetChain is a Bitcoin casino established in 2013. BetChain is a modern casino with huge deposit bonuses in Bitcoins. Recently the cryptocurrency selection has improved as also Ethereum, Litecoin, Bitcoin Cash and Dogecoin are accepted besides Bitcoin. And if you prefer FIAT currency, you can play with Euro (EUR), US Dollar (USD), Australian Dollar (AUD), Swedish Krona (SEK), Norwegian Krone (NOK), Canadian Dollar (CAD), Russian Ruble (RUB) or South African Rand (ZAR). In overall, BetChain has a very wide selection of games and plenty of deposit and withdraw options. Experienced cryptocasino established in 2013. Huge amount of casino games, 2300+ titles from 19 game providers. Solid bonuses in Bitcoins and also in Ethereum, Litecoins, Dogecoins and Bitcoin Cash. Also no deposit bonuses in free spins. Provably fair games that you can choose from the casino lobby. Hard bonus and free spins wagering requirements of 50x. The casino may ask for identity before withdrawing (from BetChain withdrawal terms). Betchain has over 2300 casino games from 19 game providers so there is a lot games to pick. Also, the deposit and reload bonuses in BTC are one of the best in the Bitcoin casino field. The lobby isn’t maybe the fastest working because of the high level of graphics and animation. Still the lobby is very easy to navigate and all the important things (games, deposits, withdrawals, account info) are just there to click. Diamond Vapor slot game from Endorphina. The promotions-page used to be not so informative, since we had to ask for further info about the Welcome Bonus promotions. But BetChain seems to know how to react to feedback and now the promotions-page is one of the most informative in online Bitcoin casinos. BetChain works great with mobile devices. We tested the site to this BetChain review with iPhone 6S and an older iPad 4. Of course the Iphone’s small screen has some limitations to gaming comfort. With the iPad the lobby and the games worked just great. BetChain offers huge deposit bonuses in Bitcoins and also other cryptocurrencies like Ethereum, Litecoins, Dogecoins and Bitcoin Cash. No bonus codes are needed to get these BetChain bonus deals. Just click the links on this BetChain review to get the bonuses. First deposit bonus is 150% up to 1 BTC + 200 Free spins (Exclusive deal). Alternative first deposit bonus “Highroller Welcome Bonus”: 75% bonus for first deposits between 2 BTC – 3.75 BTC. Second deposit bonus is 50% up to 0.5 BTC. Third deposit bonus is 75% up to 0.5 BTC. Fourth deposit bonus is 50% up to 0.5 BTC. The total of all deposit bonuses is 2.5 BTC + 200 free spins (or 5.25 BTC with the highroller first deposit). 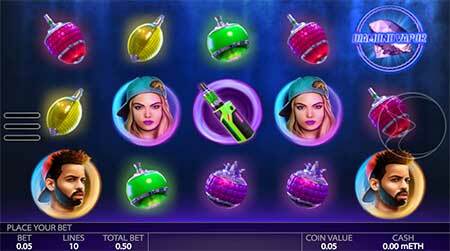 No deposit bonus: 20 free spins. The wagering requirement for the bonuses is 50x. First deposit bonus is 150% up to 10 ETH / 50 LTC / 2,000k DOGE / 10 BCH + 200 Free spins. Alternative first deposit bonus “Highroller Welcome Bonus”: 75% bonus for first deposits between 20 – 40 ETH / 100 – 200 LTC / 3,600k – 6,700k DOGE / 20 – 40 BCH. Second deposit bonus 50% up to 5 ETH / 50 LTC / 890k DOGE / 5 BCH. Third deposit bonus 75% up to 5 ETH / 50 LTC / 890k DOGE / 5 BCH. Fourth deposit bonus 50% up to 5 ETH / 50 LTC / 890k DOGE / 5 BCH. The total of all deposit bonuses is 25 ETH / 200 LTC / 4,670k DOGE / 25 BCH + 200 free spins (or 55 ETH / 350 LTC / 9,370k DOGE / 55 BCH with the highroller first deposit). The wagering requirement is 50x. 10% cashback tuesdays up to 0.1 BTC if you happen to lose.Maximum bonus is 0.1 BTC for deposits made on Monday. 25% reload wednesdays up to 0.25 BTC (first deposit of the day). Free spins friday cheers up your fridays, if you have made 1 deposit for the last 30 days. Monthly and weekly tournaments with prize pools up to 10,000€. Please read the extra bonuses’ full terms from BetChain promotions-page. Below in this BetChain review you can read more about the terms of the casino bonuses and free spins. BetChain casino slot game called Piggy Bank from Belatra. No bonus codes are needed in BetChain. Just go to BetChain casino using the links in this site and the exclusive bonuses are coded to our links. Make sure you have the correct bonus in the Bonuses tab in your account and contact the BetChain casino support if needed. BetChain offers 20 Free Spins with no deposit.Just go to the site using our links and register your account. Wager multiplier is 50x before you can withdraw your possible winnings from free spins. Wager requirement: 1x in 23 hours. You can also get up to 50 free spins every Fridays, no weekly deposit required. You need to make at least 1 deposit every month to get the free spins. Satoshi’s Secret Bitcoin slot game in BetChain. BetChain offers over 2300 casino games to choose from 19 Casino game providers. The selection is made of high quality software providers likeAmatic, Belatra, BGAMING, Booming Games, Betsoft Gaming, EGT, ELK, Endorphina, Ezugi, Gameart, Habanero, iSoftBet, MrSlotty, Netent, NextGen, Pragmatic Play, Microgaming, Spinomenal and Thunderkick. Many casinos don’t offer the choice to list the casinos based on the software provider. If you know that you like some provider more than the other, it is easy to choose by clicking on the provider name. 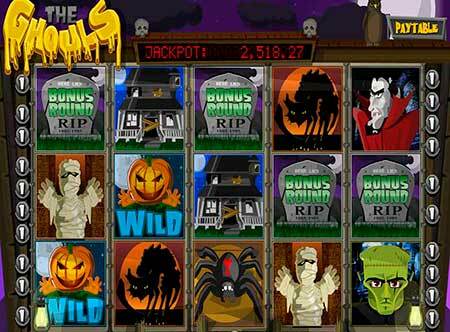 The Ghouls Bitcoin slot game in BetChain. 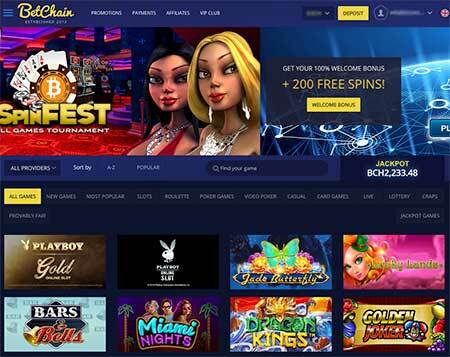 BetChain offers all the necessary casino games like slots, roulette, poker games, jackpot games and many table games. Here’s a few examples. 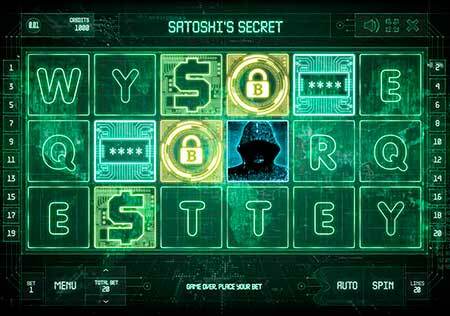 Satoshi’s secret is a slot game which is based on the mystery of Satoshi Nakamoto, the mysterious creator of Bitcoin. Many choices of video poker are also a good choice to gambling. Draw one time to catch some flushes, straights or other combinations. This example is Deuces Wild Video Poker we tested to this BetChain review. 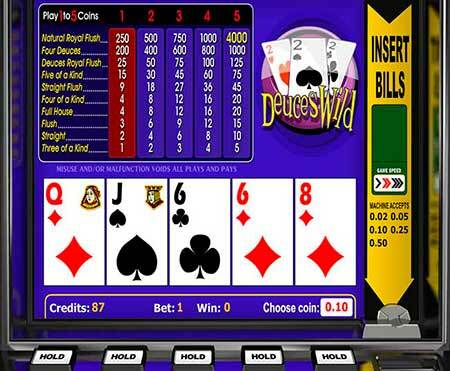 Video Poker named Deuces Wild in Betchain Casino. 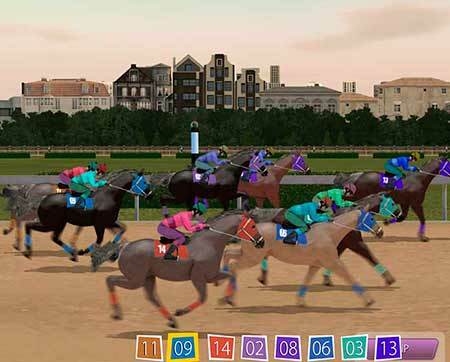 If you like to have some of the thrilling betting spirit, you can try the Horse Racing game. In Horse Racing you must bet the winning horse and the harder the choice, the more you can win. Horse Racing game in BetChain Casino. Besides these games there are over 2300 other games to choose from in BetChain. In a nutshell: players from USA, UK, Spain, France, the Netherlands and Israel are not allowed to deposit and play real money games in BetChain casino. Players from Sweden won’t be able to play NetEnt games. Also some payment methods and all casino bonuses are not available to Swedish players. Some casino sites claim that BetChain would accept players from USA, but these are real facts read from the BetChain casino terms and conditions. However players from USA can probably create a Bitcoin account, deposit and play, but you have to make it with your own risk. It is possible that the account is frozen if the casino finds out that the terms have been violated. Who can play: The Casino accepts players only from those countries and geographic regions where online gambling is allowed by law. It is the player’s sole responsibility to inquire about the existing gambling laws and regulations of the given jurisdiction before placing bets on the website. Users from the following countries (“Restricted Countries”) are not allowed to deposit and play real money games: USA and its territories, UK, Spain, France, the Netherlands, Israel. The casino cannot guarantee successful processing of withdrawals or refunds in the event that player breaches this Restricted Countries policy. 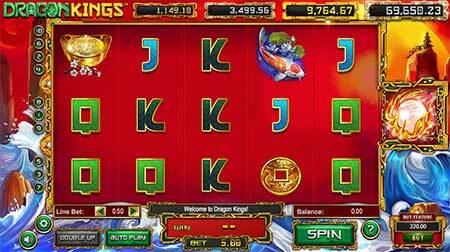 Dragon Kings slot game from BetSoft casino game provider. Here are the most important withdrawal and bonus terms and wagering requirements. Please read the full terms from the BetChain casino website -> terms and conditions. • The casino may ask for identity before withdrawing. • The maximum withdrawal amount processed to a player is 0.5 BTC or 3,000 € per week and 10,000 € or 2 BTC per month … Exceptions may be made to players with a higher VIP level, if any, at the Casino’s sole discretion. • If you win more than 5 BTC or €15,000, the Casino reserves the right to divide the payout into monthly instalments of maximum 2 BTC or €10,000 until the full amount is paid out. Please read the full terms from the BetChain bonus website, but these are the main points. Note that the bonus wagering requirements are quite hard, since on many casinos the requirement is 35x or 40x. In BetChain casino you have to wager the bonus deposit amount 50x if you want to withdraw the bonus winnings. • Bonus wagering is 50x, so you have to wager the bonus amount 50 times before you can withdraw your winnings. • Slots count 100% on wagering. • Bets on blackjack, craps, poker and dice count 5% to wagering. • Bets on roulette and baccarat do not count to wagering. • Maximum bet is 0.0013 BTC, 0.01 ETH/BCH, 0.06 LTC or 1000 DOGE. • Duration of the bonuses is 1 month. • No BetChain bonus code is needed to the bonus. Also the terms on free spins are quite hard in requirements. The multiplier is 50x and there is also minimum deposit limits and maximum winnings limits from the free spins. • 200 free spins are given in 10 free spins parts x 20 consecutive days. • Minimum deposit to get the free spins: 0.05 BTC, 0.05 ETH/BCH, 0.25 LTC or 10k DOGE. 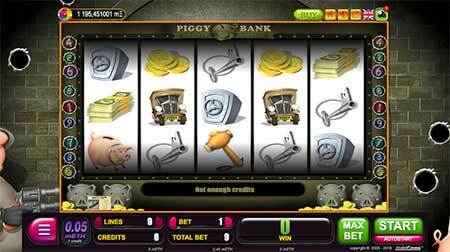 • Wager multiplier is 50x before you can withdraw your possible winnings from free spins. • Wager requirement: 1x in 23 hours. • Maximum win from the free spins bonus: 0.01 BTC, 0.1 ETH/BCH, 0.5 LTC or 20k DOGE. Please see the full wagering limitations on BetChain bonus terms and conditions-page. Note that the no deposit bonus is not available to players from following countries: Afghanistan, Albania, Algeria, Angola, Belarus, Cambodia, Canada, Czech Republic, Ecuador, Estonia, Finland, Guyana, Hong Kong, Indonesia, Iran, Iraq, Israel, Korea, Kuwait, Lao, Latvia, Mexico, Myanmar, Namibia, the Netherlands, Nicaragua, Norway, Pakistan, Panama, Papua New Guinea, the Philippines, Poland, Romania, The Russian Federation, Serbia, Singapore, South Africa, Spain, Sudan, Syrian Arab Republic, Sweden, Taiwan, Turkey, Uganda, Ukraine, the UK, the USA, Yemen and Zimbabwe. BetChain is an excellent crypto currency casino which offers something for everyone. The game selection and currency choices are very good. There is also support to many FIAT currencies like Euros or US Dollars. The bonuses and game selection are exceptionally good. Especially starting in August 2018 BetChain offers also bonuses to Ethereum, Litecoins, Dogecoins and Bitcoin Cash. BetChain casino is an excellent all-around casino with great bonuses and wide support of cryptocurrencies. If you want to choose only one casino to play, BetChain gets our recommendations. The casino works well in all fields and has no major flaws. If you want to point some out, maybe the quite hard bonus wagering requirements and limitations to free spins winnings are one thing. Here is the user rating summary of BetChain casino. Your opinion about BetChain Casino? Please share your thoughts! Or go here to find more Bitcoin casino reviews. Good, I want to report something that is very distressing to me, I am a client of Casino Betchain and I want to claim the reason for the withdrawal of the funds and left me with what I initially deposited as a consolation, if my funds were illegally won because they give me back what I deposit as a form of consolation, it is evident that everything is a trap that Betchain uses a method to deceive, they must have all the money of my account if my game was illegal as they say. This company does everything in such a way that customers are not aware of the actions they perform on the platform and produce the loss of the benefits of these. This is far from being a clear action. There are no robberies to the few people who were fortunate enough to be able to win at this casino. I have all the screenshots of the shares I tube Betchain with my case to continue with a legal action, I am now giving a gift of 0.02 to stop claiming what belongs to me in bribe mode. That this company has dedicated to the scam? I do not want any charity gift for my silence, I want my 1.4861 btc to win legally and that company systems also allowed me to win. I need a solution to this urgent fraud and recover all my money. I want to add that in my plays I have several bets of less than 0.01 with positive winnings and I also took them away. That is, it really is what is convenient to carry out the fraud, how to explain that they left in my account 0.02 BTC, apparently Betchain policy is to do, put and take what you want when you want. it is still not clear how the company deal with the case, it is still a proven scam of this company, if the law is the law, and if I violated its terms and should have left my account at zero, they are putting and taking it that best suits you, I will not only demonstrate this fraud against me, but also all the scams that personally and softswiss employ to deceive each of the customers to take many times through a dead end, do not put anything in the place to see it, are not clear with the issues of regulation when the stimuli are active, they design their entire system to attract customers in this street, which leaves them gains based on the scam they employ. because of all these anomalies in the behavior they have to earn their money I will start as soon as possible multiple claims in the corresponding offices of consumer attention against you and this vil method that employ. Thank you for your comments Alejandro! Thank you for the review Alejandro!